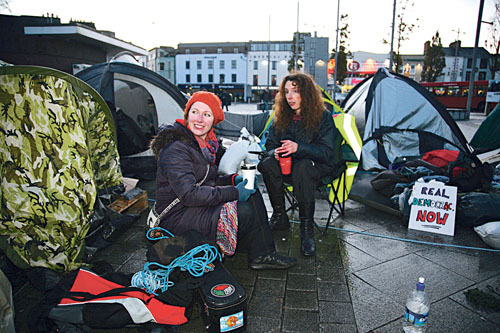 It may not have the dramatic scale or numbers of Occupy Wall Street, but Occupy Galway in Eyre Square has become the subject of much interest, debate, and curiosity, as well as expressions of good will and solidarity between public and protester. Inspired by the events in New York, five Galwegians pitched tents in Eyre Square last Saturday afternoon. By Wednesday, the group had not only survived the howling winds and lashing rain of earlier in the week, but their numbers had grown. Today there are 10 tents with 30 people taking part in what has become Occupy Galway. Along with their tents, the group have set up a kind of marquee where they sit and eat and there are posters on tents and on the glass hoarding surrounding the Browne Doorway, outlining their views on the current state of the Irish economy, the recession, and the Government’s response to it. How will occupying part of Eyre Square contribute to showing public disaffection with the State of the economy and highlight to Government the anger and fear people feel over the future? The group is determined to stay in Eyre Square and have no intention of giving up their protest. They say no one from the Galway City Council or the gardaí have requested them to move. However what about next month when the Continental Christmas Market is due to be established in the square?